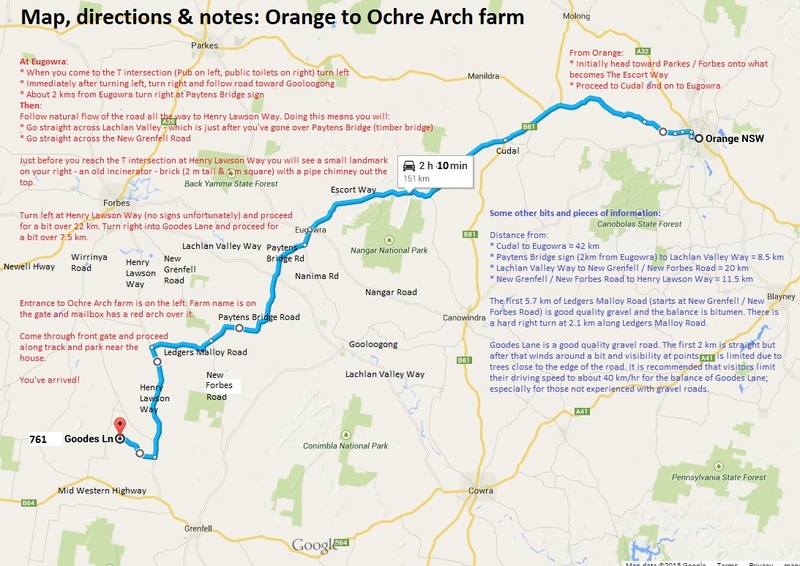 written directions and maps to the farm from Orange and West Wyalong. Enter the Ochre Arch entrance gate on the right and proceed for about 300 metres to the house. Entry gate to the farm is on the left and is signed “Ochre Arch”. Mailbox has a red arch over it. Entry gate to the farm is on the right and is signed “Ochre Arch”. Mailbox has a red arch over it. Turn left into Reymond Street and proceed across the Lachlan River bridge and follow the road as it veers to the right and becomes the Henry Lawson Way. Travel approx. 40 kms and turn right (west) into Mortray Road and proceed for approximately 10 km. NB: The Mortray Road turn-off from Henry Lawson Way is not far past the Bald Hill Road turnoff (on your left). Turn left (south) into Pinnacle Road and proceed for 5 kms. Entrance to the camping area is via double gates on the right approx. 2kms along Goodes Lane from Pinnacle Road. Enter through the gates, go straight ahead along the farm track for about 30 metres and then turn right and select a site adjacent to the large trees in the paddock on your right. 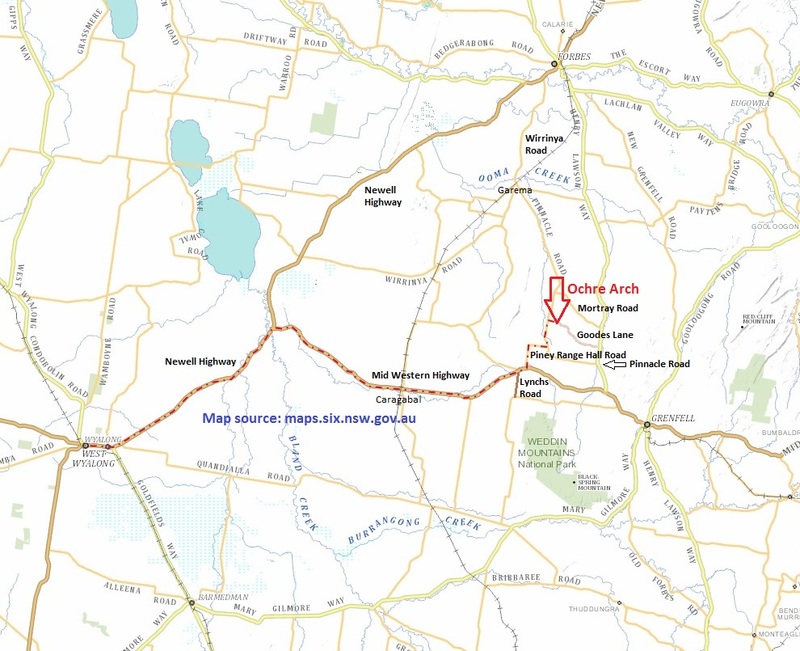 We recommend that you travel to the farm via Forbes or Grenfell rather than Eugowra and Ledgers Molloy Road. Turn right (east) towards Grenfell onto the Mid Western Highway. This intersection is not far past the large ‘Safety Camera’ frame that spans the highway. Proceed along the Mid Western Highway for approximately 45 km. NB: About 24 km from the above intersection the road goes through the village of Caragabal. A map showing the above route is below.